I remember student teaching very clearly. I was a ball of emotions: excited, nervous, joyful and scared, just to name a few. Teaching is an important job and I was ready for the challenge… ready to change the world one student at a time. Although I had heard horror stories about student teaching, I knew my classmates and I would be able to have a positive experience. I learned a ton during student teaching and you, too, can have a successful experience by using these helpful tips to survive your time as a student teacher. 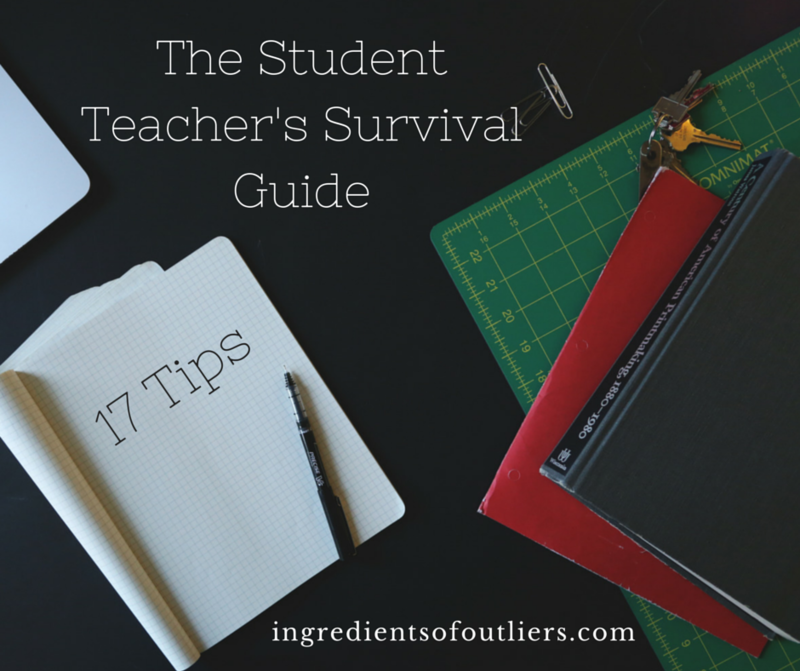 The following tips are a compilation from my own personal experience, Teaching the Teacher, A to Z Teacher Stuff, and Teacher Knowledge Journal. 1. Meet with your cooperating teacher BEFORE you start. It is advantageous to meet with your cooperating teacher as soon as possible so you can hit the ground running when you start. When you meet, get to know their expectations and establish your expectations for the year. Yes, you read that right, you should have expectations too. For example, most student teachers want feedback from their cooperating teacher. Letting to teacher know what you’d like to get out of this experience shows that you’re invested and is ready for the challenge. 2. Be open and willing to learn. While what you learned in your college classroom is important, not all textbook tactics will go smoothly for you. The teachers you observe have valuable experience with real-world teaching and this is your opportunity to glean the best tips and tricks of the education trade. The teachers you work with will show you how to apply the concepts you’ve learned to an actual classroom, which will help you grow into a successful teacher yourself. 3. Build relationships. Student teaching is like a long-term interview, so be intentional with the relationships your build. Getting to know your principal early on could open doors in the future, and getting to know other staff will broaden the spectrum of perspectives you are exposed to throughout your time at the school. Building relationships with the students is also critical, as students will respect and respond to you the more you connect with them. Remember, it is usually better to set a stricter tone in the beginning and adjust to the nature of the classroom over time. Students will call you out of you start off ‘soft’ and then establish strict rules later in the game. 4. Ask questions. As a student teacher, your role is to learn as much as possible. A key part of the learning process is asking questions, so don’t hesitate to ask a question, whether it be for clarification or pure curiosity. It is helpful to keep a notebook to jot down questions that come to mind or ideas you really like. 5. Plan, plan and plan some more. It is important to plan out units so you can have a schedule, not only for your own preparedness, but also students’. It is always beneficial to review your plan with your cooperating teacher so he or she identify flaws in planning and give constructive feedback. 6. Always have a plan for if you have extra time during class. Whether you use a fun group activity, a recap of other lessons, or challenge worksheets, keeping your students engaged during spare time is a must! You do not want students sitting around with nothing to do, especially because that is the time when students typically become restless and distract other students. 7. Get student input on your lessons. Your students are often the best indicator for what is working well and what needs to be improved upon. Give your class an opportunity to let you know if a lesson leaves them wanting a greater challenge or further explanation. Many teachers create a suggestion box or include a student feedback portion in their exit ticket. 8. Address problems sooner rather than later. Students will test boundaries and push limits to see what they can get away with, so don’t be afraid to correct behavior when necessary. However, be cautious to not to put down a student in the middle of class. Sometimes it is best to talk to a student after class or have the student come in at lunch. Keep in mind that consistency is key, so follow through on consequences. 9. If allowed, make copies of material your cooperating teacher has. These will come in handy when you have a classroom of your own because you will already have a working repertoire of curriculum. Include notes of how certain lessons are executed to simplify your preparation process in years to come. 10. Put in extra time. When you are able to go to parent meetings, tutor after school or attend school events, do it! You will soon be doing these activities when you have your own classroom, so the extra experience will be to your benefit. 11. Be innovative. Do not be afraid to spice up your lessons! Collaborate with your cooperating teacher about different ideas you have that will make the classroom more interactive. You may also use outside resources such as Pinterest and Teachers Pay Teachers to gather creative lesson ideas. For example, the Outliers Series has close reading lessons for sale on Teachers Pay Teachers: https://www.teacherspayteachers.com/Store/Outlier-Series-Lesson-Plans. 12. Interact with parents. Parents play a huge role in their child’s education, so your ability to understand and communicate with them matters. From complaints to conversations about failing students, you will encounter parents with a variety of backgrounds and attitudes throughout your teaching career. Now is the time to practice navigating those parent relationships so that you are equipped to respond to anything that comes your way with tact and composure. 13. Empower students. Sometimes students are trapped in the negative mindset that they are not good at a certain subject. As a teacher, you have the privilege of empowering students by listening to their concerns and speaking to them with encouragement. 14. Keep up with paperwork. You may be surprised at how quick paperwork can pile up during student teaching. Make sure you grade assignments in a timely matter, as students need to know how they are doing so they can fix their mistakes before a quiz or test. You’ll also want to complete the assignments yourself so you know exactly what the students are doing and where they may run into trouble. As you do this, create a step-by-step answer key for future reference during grading. 15. Take initiative. Show initiative by surveying what needs to be done and taking care of it, whether it be helping a student or organizing papers. Going above and beyond without being told shows your coordinating teacher that you are self-sufficient an able to assume more responsibility. 16. Reflect on your lessons. Every lesson can be fine-tuned, so take the time to review what you’ve taught. Jot down what you thought went well, what needed improvement, and what you plan on changing. Your cooperating teacher should also have valuable feedback on the delivery of your lesson and will often point out things you don’t remember. 17. Relax and enjoy your experience. This is such a significant season of growth, so enjoy the relationships you build and experience you’ve gathered. While teaching can often be a thankless job, you have the privilege of being part of countless victories. Nothing is more rewarding than watching a student finally have that ‘ah-ha’ moment!